Skiing… the exceptional sensations of sliding, the breathtaking landscapes, the tanning with the trace of the mask… and the cold. Every skier has already been exposed to it, and it will continue to be so as long as the sport exists. Nevertheless, the question of refrigeration raises problematics that are often very constraining. Whether the skier’s feet, hands, or face are cold, this feeling is just disagreeable. Who hasn’t had their skiing day ruined because their feet were cold? In addition to being annoying, this feeling of cold is also very frustrating. You thought you were well prepared, but this enemy quickly caught up with you. We will give you our advice on how to fix it! Do you know what the main purpose of the body is? Survive. To do this, it primarily preserves vital organs such as the heart, brain, kidneys, or lungs. So, as soon as he feels that an external element can affect him, he sets up a defense system. In other words, it mainly flows blood to vital organs. As a result, the extremities are less fed with blood, causing the retracting of the blood vessels. In need of blood, the feet cool down, causing uncomfortable situations, especially on ski slopes. N°1: choosing the right ski boots! So far, nothing very surprising, but you will see that it is very important to protect your feet from the cold. When buying or renting your ski boots, you must meet two criteria: don’t be too cramped and have a thick boot that will isolate your feet from the cold. In addition to providing you with warmth, it is essential for the comfort of your feet. Before starting each day of skiing, it is also essential to adjust your boots properly. This means that they should only be tightened in such a way that they provide excellent support for the foot, without being compressed. In which case, it could affect the proper circulation of the blood. The more cramped you are, the more you risk getting cold feet. The little trick: give the shoe time to adapt to your foot. To do this, tighten your shoe only slightly for the first run. Do the same for the second track by tightening a little more. Repeat the operation until you find an optimal comfort position. The issue of ski socks remains controversial. Some people prefer technical, breathable socks made of synthetic materials. Others find it beneficial by stacking the pairs of soles. Indeed, this second technique raises issues of comfort and mobility. Stacking socks could over-compress your foot into the shoe. If we follow the logic outlined in Tip 2, doing so will make your feet even colder. Moreover, being already well held in a ski boot, adding extra layers would limit your movements. Our team strongly advises you to use technical insoles! These are thin, and will give you more comfort and better insulate your feet from the cold. The fact that they are breathable will wick away perspiration and prevent any cooling of the feet. Heated insoles seem to be the solution for the most chilly of you. 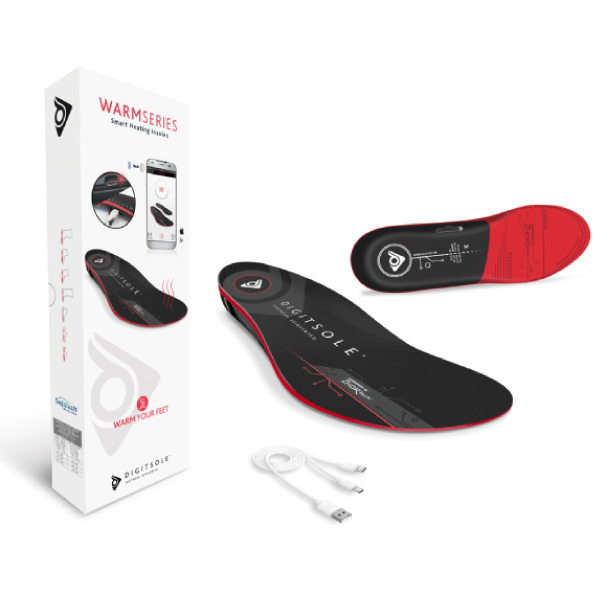 The Warm Series Digitsole insoles are a good example! These are efficient thermal and connected insoles for any individual with cold feet in winter. The Warm Series are rechargeable and directly connected to a mobile application. Via this interface, you can set the heating temperature of your insoles from 20 to 45°C and have access to the details of your itinerary via your GPS data. In addition, they are light, thin and comfortable soles, so they are suitable for ski boots. Finally, their 7-hour autonomy will allow you to warm your little feet all day long. Say goodbye to the cold!